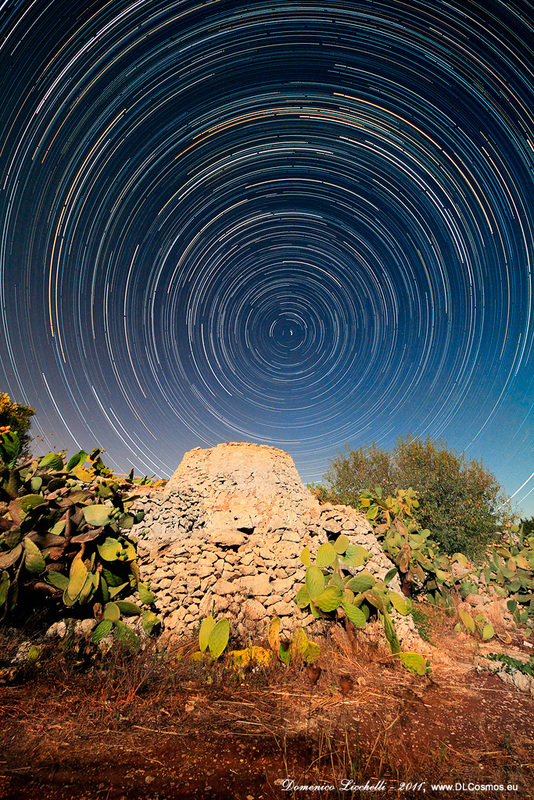 Most of us have seen the intriguing long-exposure photographs of star trails around the North Star (Polaris). Such photos result in homocentric circular arcs, with Polaris near the center (see the related links below). But how close to the actual center of the celestial pole is Polaris itself? Note that Polaris is the end star in the tail of Ursa Minor. The image above illustrates the trail of only Polaris as it would have appeared in a long exposure. Because light pollution in the area where the image was taken (Leiden, the Netherlands) compromises the success of very long exposures, I instead stacked several short exposures taken a few minutes apart to produce the same effect. As shown, Polaris is approximately 45 arcminutes (three quarters of a degree) off center of the actual North Celestial Pole. Image taken on September 21, 2011. Photo details: Camera: Canon EOS 30D camera; 90 mm focal length; f/5.6 aperture; exposure time - 20 seconds every 5 minutes; ISO equivalent of 1250; no exposure bias; manual exposure mode; colorspace sRGB,; image processing was done with Adobe Photoshop CS2; maps were created with TheSky6 Astronomy Software.